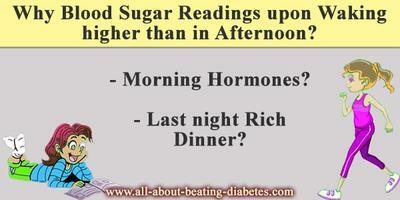 QUESTION: When I test my blood sugar in the mornings prior to eating breakfast the number is higher than it is in the afternoon after eating. You have to know that the glucose metabolism is very complex and it’s regulated by several hormones. It is true that insulin is the only one hormone which is reducing the blood glucose by putting some of the glucose inside the body cells. Therefore, when there is not enough insulin in the organism, the patients are starting to suffer from permanent high blood glucose level. On the other side, there exist few hormones which elevate the blood glucose level, including glucagon, cortisol, adrenalin, noradrenalin, T3 and T4. These hormones are secreted from different glands, but all of them are having the same effect: to increase the amount of glucose in the organism. Another important fact to be emphasized here is that the secretion of these hormones during the day differs. So, some of them are having increased secretion in the morning and reduced secretion in the evening; while, others are having reduced morning secretion and increased secretion in the evening. Coming up to your concern, waking up is recognized as some kind of a stress for the organism. Therefore, it requires more energy to start its normal activity. The required energy is provided by high amounts of glucose, which is obtained from the increased secretion of these hormones. Particularly, adrenalin, noradrenalin and cortisol are the hormones, which are elevating the blood glucose level in the morning, no matter if it is before or after breakfast. You have to know that their secretion begins 5-15 min after waking up and this elevated secretion is observed for other 2-3 hours after waking up. After this time, the secretion of these hormones is reduced to its normal level. Meanwhile, when the secretion of the blood glucose elevating hormones is increased; the secretion of insulin is reduced and vice-versa. As you may see, it is normal for someone to have elevated blood glucose level several hours after breakfast, because the amount of glucose elevating hormones is still high. But, it is not quite normal to have an elevation of the blood glucose level before having breakfast, except if you have eaten something very late at night. In several cases, the morning blood glucose level before breakfast is observed because the patients eat something around midnight. This is not a good practice, because while you are asleep, your body is not able to use the glucose, which you have acquired with food, and it start to accumulate in the blood. Furthermore, elevation of the morning blood glucose level may appear as a result of a dinner rich in carbs. This is happening because the organism needs time to metabolize the glucose and to put it into the blood stream. This explains why, when the amount of blood glucose is high, your organism will take more time to metabolize it. It is good that your afternoon blood glucose level is lower than the morning one, because this is showing that the organism is able to compensate the changes in the glucose amount. However, you have to know that the elevation of the blood glucose level in the morning is not a sign of diabetes, besides this, the exact values are also very important. Keep in mind that there are people who have a normal and healthy life, without developing diabetes, with a little bit higher blood glucose level due to individual differences in the glucose metabolism. In purpose to define someone as a diabetic, permanent elevation of the blood glucose level has to be observed during the whole day. In addition, there are several glucose tests, which have to execute to see how is your blood glucose changing during the day. Next, I would like to have your exact results of the blood glucose tests in the morning and in the afternoon, because an elevation of 1-2 points is not something which attracts attention. My other advice is to try to avoid meals late at night, and to exclude meals rich in carbs at dinner, and encourage to eat more vegetables. Furthermore, you are supposed to check regularly your blood glucose, and if there is a problem with it, you have to inform your doctor immediately. Other good thing to do is to start running in the evening, because in this way you are going to burn some of the glucose in your blood, which will cause its morning reduction, and keep it under control.